In January 2015, I wrote an enthusiastic review of Rosie Jackson’s first pamphlet What the Ground Holds for London Grip (the article can be found at https://londongrip.co.uk/2015/01/london-grip-poetry-review-jackson/), finishing with my anticipation of a full collection. My anticipation has been well-rewarded with this new collection from Cultured Llama Press. Jackson’s work has the ring of a confident poet writing at the height of her powers; brilliant poems from her earlier pamphlet nestling alongside new companions as brilliant. This collection is largely inspired by visual arts; ekphrastic poems, which for me have to work hard to succeed. I find too often they tend to fall into description and interpretation that is becoming stale before it hits the page. Jackson’s are of a different order. 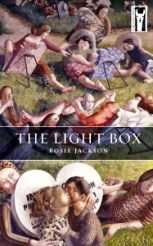 She does not ‘describe’, but rather ‘expands’ the possibilities of paintings, in particular, Stanley Spencer’s. The book is divided into six sections, each headed by a poem based on a key Spencer painting. The poem and painting together allow for fresh ekphrastic expression as individual poems that follow are less about the subject(s) portrayed, but flow from what the painting suggests and then take off in their own magical directions. The first section, titled ‘Love’s Exuberance’ begins with a poem based on Spencer’s Love Letters (1950) An outsize armchair holds two child-like figures: a boy clasping letters to his face and chest, a girl slipping one into his pocket. In the poem, the letters Spencer actually wrote to his ex-wife Hilda, following her death, become the relationship between the couple: …he ‘cannot live, cannot breathe’ unless she writes to him again, that ‘there is no future / without this writing in it’. (‘Touch Paper’). This poem heralds the impressive arc of the collection where light is shone on matters of importance, introduced via the painting, decoded by the poet. condemned to be in service forever. on autumn leaves, your face implacable. the drum of his heart under naked ribs. This extraordinary collection filled me with envy and joy in equal quantities. Read it and see.